?smail Ta?p?nar, the captain of the Salih Reis, a passenger ferry belonging to ?stanbul ferry boat company ?DO, testified at the Port and Dock Police Station in accordance with an order from the public prosecutor. 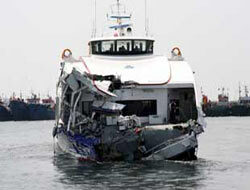 Prosecutor ?lker Ya?ar opened an investigation into the accident because some of the passengers were wounded. The Salih Reis rammed head-on into Ukrainian freighter Semyon Rudhnev, which was anchored off the northwest coast in the Sea of Marmara on Monday, slightly injuring dozens of ferry passengers and seriously wounding one. The Semyon Rudhnev"s captain, Arthur Nesternko, also testified and was released on Tuesday. In his testimony Ta?p?nar said he took off from the Yenikap? port at 10:50 a.m. A member of the crew came up to him and to convey some information. “At that moment, I got distracted for a second and I saw a small, old-type ship in front of me. I did what I had to do in this congested area, but I couldn"t avoid crashing into the other vessel,” he said. Ta?p?nar was released shortly after giving testimony. Head of the Turkish Pilots" Association Vice President Haydar Yuce said the Ah?rkap? area of the Marmara experienced heavy traffic all the time. “If the boat was speeding, there would have been a bigger accident and more damage,” Yuce said, dismissing some media stories on Tuesday claiming that Ta?p?nar was going too fast. Of the injured passengers, 47 of 48 were released from hospitals they were taken to on Monday. Insurance companies working with ?DO are paying for all expenses of the passengers undergoing treatment. Meanwhile, ?stanbul Mayor Kadir Topba?, who is on vacation in his hometown of Artvin, monitored the accident and its aftermath closely. He also called some of the passengers injured during the accident personally on their mobile phones to wish them well. ?DO will be sending all 449 passengers flowers and possibly free-of-charge travel offers on its ferries to compensate for the bad memory of the accident.